Wet n Wild just upped their lipstick game. I was lucky enough to get my hands on a few shades of the new silk finish lipsticks a few weeks ago. I’ve been wearing them for a while now and I’ve got to say, I’m pretty impressed. Just like most girls, I used a lot of Wet n Wild and NYC products as a teen. It was the inexpensive alternative that had all the cool colors I was looking for. You know what I mean! They had the bright purples, blues, green eyeshadows, black eyeliner, and the oh-so-funky nail polishes. They were cosmetics I could afford that didn’t make me itchy or smelled funny. Each one of these lipsticks are .99 USD. Yes, you read correctly! $.99! Oh, and sometimes, if you’re lucky, drugstores have buy two get one free or buy one get another half off. I was one of those lucky individuals that scored these sales. From right to left: 515D What’s Up, Doc?, 543B Mink Brown, 532E Java, 536A Dark Wine, 5352 Black Orchid, 526C Retro Pink, 513C Ready to Swoon, 527B Fuchsia with Blue Pearl, and 517C 15 Minutes Aflame. 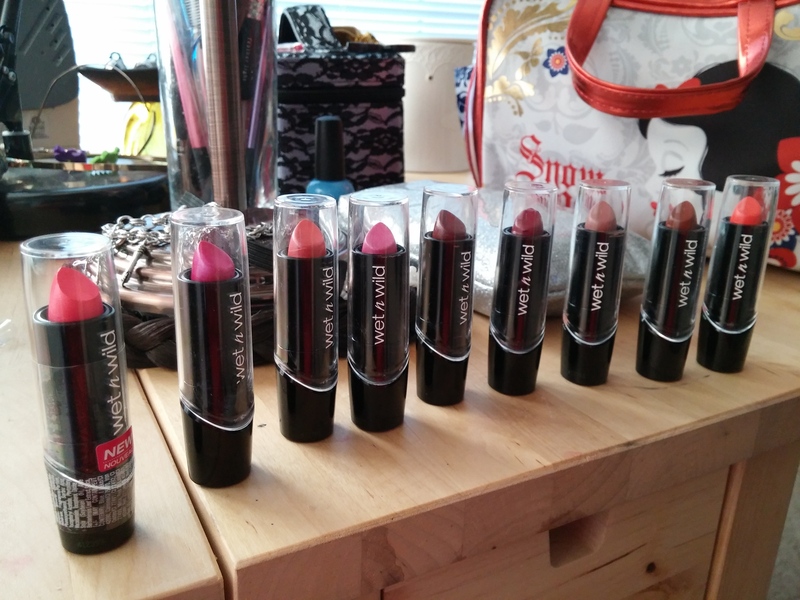 I paid about 6 dollars for all of these lipsticks. 6 dollars! CRAZY! I loved the new packaging. I’ve bought the silk finishes before. Unfortunately, they used to come in this kind of gray and very unappealing packaging, They were originally, okay. I wasn’t a huge fan. They had that waxy kind of taste most inexpensive lipsticks have but for the price, I couldn’t really complain. That’s not the case with the new formula! The new ones are sleek and sophisticated. I mean, for .99 cents I was blown away. They’re creamy, pigmented, and come in a amazing assortment of colors. They last rather long without lining your lips and even longer if you do. Some of the deeper colors tend to bleed but not too badly. My favorite shades are Ready to Swoon, Dark Wine, Mink Brown, and Black Orchid. From right to left: 515D What’s Up, Doc?, 543B Mink Brown, 532E Java, 536A Dark Wine, 5352 Black Orchid, 526C Retro Pink, 513C Ready to Swoon, and 527B Fuchsia with Blue Pearl. Did you see my fashionable kitty pajama pants? Oh-so-stylish! 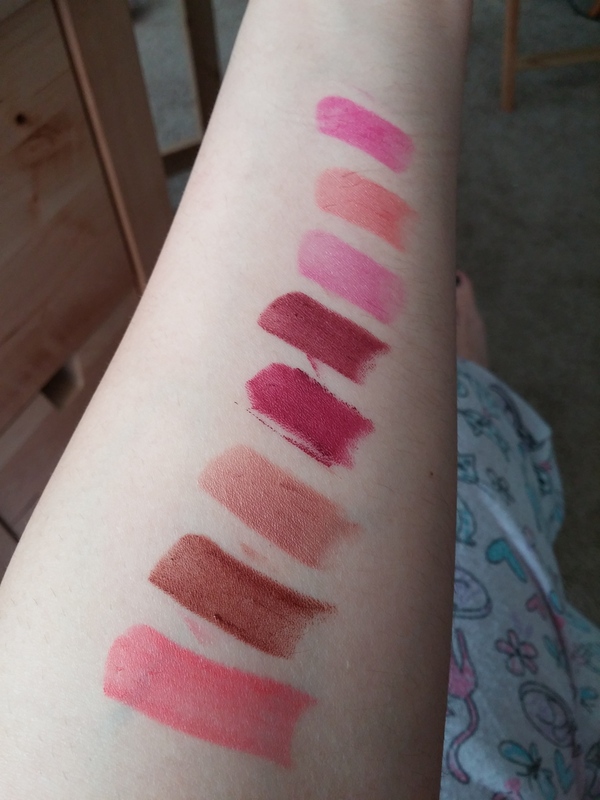 These swatches are a little messy, I apologize but I was feeling lazy and didn’t want to make the journey towards the makeup wipes. Let’s just accept these swatches and acknowledge my laziness. Anyway, if you’re looking for for quality lipsticks that are inexpensive these are a no brainer. You’ll definitely find the shade you’re looking for. I’d definitely suggest using them with lip liners but you could also rock them as is, just be prepared for the possible bleeding (not literal). You can purchase these at your local drugstore. I ordered mine off drugstore.com. Great swatches. These look amazing! I’m not entirely sure but I don’t think Wet n’ Wild is sold in the UK. Good idea! I’ve been looking for inexpensive & high quality (at least compared to the fact they’re cheap) lipsticks for awhile. Thanks for your honest review.